On Friday 3 July, Sr Stella and I had the honour of going to York Minster to Alison White’s Consecration as Bishop of Hull. Alison has known CSMV for several years and has led a number of Sisters’ and Oblates’ Retreats. We have much appreciated her ministry to us and were thrilled when it was announced she was to be made a Bishop. For the service, Alison had expressed her desire to make the Religious Life visible in a quiet way and so had invited a number of Religious from different Communities to assist in the distribution of Communion – ourselves included. The occasion was truly wonderful: so many people present that they ran out of service books; the resounding applause which went on and on as Alison was welcomed as a newly consecrated Bishop; the music, both traditional and contemporary; the sense of the Spirit at work breaking new ground and the great privilege for us of helping administer Communion and of being part of the procession, thus being a visible presence on behalf of CSMV and the Religious Life. 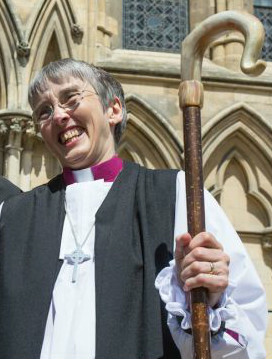 We give thanks for Alison and continue to pray for her as she begins her ministry as Bishop of Hull.